Another winner for Ginger Scott. 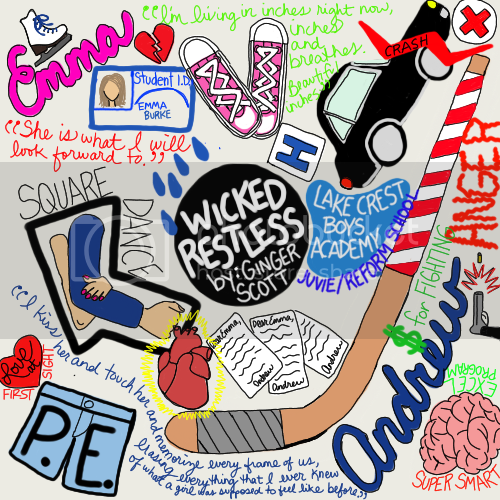 WICKED RESTLESS features Owen Harper's brother(Wild Reckless) Andrew. While it isn't necessary to read WILD RECKLESS first, it will add to the overall story - making it a richer experience. Andrew was kind of sheltered from the Harper family drama when he grew up. He was too young when his father died (under total tragic and gossip-worthy circumstances) and when his oldest brother died, his other brother, Owen, was mostly involved. While he does feel the stigma of the "Troublemaker Harper Boys," it isn't something that has plagued him. Andrew is SUPER smart. He has been enrolled in a special program for highly gifted students for years. BUT, he is lacking one class to graduate that he can't get through Excel - a P.E. credit. So, Andrew is forced to attend P.E. at the local high school. It's there that he meets Emma and is completely blown away. It is love at first sight for him and he'll do anything to spend some time with her. Eventually, they go out and the connection they feel is amazing and mutual. Andrew is happy and sees nothing but blue skies ahead as long as Emma is in his life. BUT, tragedy strikes, tearing apart both Andrew's and Emma's worlds. In order to save Emma from the consequences of a terrible accident, Andrew takes the blame. He never expected his punishment to be so severe though. He is sent to a juvenile detention facility and the only thing that keeps him going is his thoughts and memories of Emma. He writes her all the time telling her about his experiences there and how desperate he is to hear from her, but Emma never writes back. 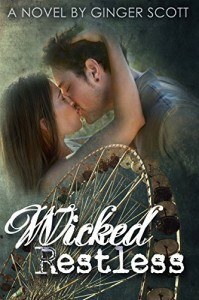 Eventually, Andrew is left bitter and betrayed and his love for Emma turns to hate. Fast forward several years. Andrew is in college and attempting to make a life for himself. He has anger issues that he resolves by fighting in illegal boxing matches. Not only does the violence and pain ground him, he makes a lot of money which allows him to attend college and afford daily expenses. Andrew isn't a great guy - meaning he uses women. He and his roommate have this thing where they bet each other whether or not they can pick up certain girls or not. The night Andrew's life changes is the night he is dared to pick out a girl to make his target. He has a system. He walks by a bar table and looks for a driver's license or university ID sticking out to pick up. Later he approaches the girl to return it and then makes his move. This particular night the ID he steals belongs to none other than Emma! He is angry that she is there acting like she is having the time of her life when he suffered so much for her in the past. He soon devices a plan for revenge. Instead of targeting Emma he decides to hit on her best friend/roommate and torture her with his presence. The problem is, the time he spends with the best friend only makes him want Emma all over again. Will he be able to put his anger aside and forgive Emma? Will they be able to build a relationship again? Can they even be friends? Why did Emma not respond to him all those years ago? Ginger Scott writes so that your heart breaks for Andrew. You feel his anger and sadness. You feel the betrayal. You sympathize with all he had to go through to protect Emma. You root for them to get together and pick up where they left off in high school. If you like edgy, dark, young adult/new adult romance you'll definitely want to put this one on your tbr. Here is my sketchnote for the book.